Giraffe Hero is a person who sticks his or her neck out on sustainable basis, for public good, at huge personal risk. Giraffe Heroes India Program is an off-shoot of non-profit Giraffe Heroes Project which was started in USA in 1984,by Ann Medlock. The aim of starting this Project was to find out unknown heroes of the society, commend them as Giraffes for sticking their necks out & get their stories told on radio, television & in print. Giraffe stories would tell the people that there was headway being made on the problems of the world, that there were individuals who had solutions & the courage to move into action. The stories would move people`s souls & get them moving on public problems that mattered to them. The idea of telling heroes’ stories to inspire others to action, has deep roots. People have been telling the stories of heroes for thousands of years as a way to communicate their culture’s values. Ann Medlock invented the Giraffe Heroes Project to do the same thing for our times. She knew that stories go straight to the heart and stay there, bypassing the objections that the mind can throw up to keep out theories, rules and admonitions. Ann also knew that the giraffe metaphor and imagery were great ways to get people’s attention, to engage their interest and, once engaged, to get past both their fears and their anti-message radar. The Project was telling Giraffe stories, not just on radio, but on television and in magazines and newspapers. It began publishing Giraffe News and Giraffes were being featured in major media such as Time, Parade , USA Weekend, Readers’ Digest, People, The New York Times, Glamour, CBS, PBS, CNN, ABC and the Voice of America. The exposure attracted resources of many kinds to the Giraffes, and their stories inspired others to action, from setting up a soup kitchen in Tucson to saving a wetland on Long Island. Giraffe speeches were inspiring and coaching audiences all over the world on how to stick their necks out for the causes they believed in. The Giraffe Heroes Project has now honored over a thousand Giraffes, and reached over a quarter of a million kids in schools all over America and inspired more people through Giraffe speeches, books and the website. In 2009 the Project launched Giraffe Heroes International, a subsidiary designed to manage all of the Project’s burgeoning international work. By 2011, GHI was operating in the UK, Nigeria, Sierra Leone, Egypt and Nepal. Giraffe Heroes India [India is the sixth country where this program is launched] aims to bring Giraffe vision, strategies and tools for change to the 1.3 billions people on the Indian subcontinent – making it potentially, by far, the largest Giraffe global affiliate, launched to date. Like all Giraffe operations, GH-India will tell the inspiring stories of the country’s heroes, motivating others to become heroic too. GH-India will also offer practical tools, citizen activists need, to succeed, as well as Giraffe civic engagement programs in schools, helping young people build lives as courageous and compassionate citizens, serving a vibrant India..
Do you know of a hero in India – someone who is sticking his or her neck out for the common good, helping solve a significant public problem? 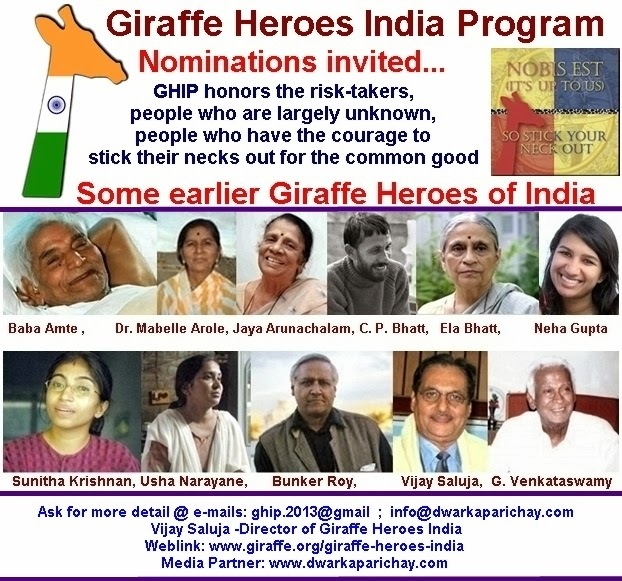 Giraffe Heroes India wants to hear about such heroes & thereafter in telling their stories all over India, Giraffe Heroes India hope to inspire many more Indians to get active too, helping create change where it is needed most. Kiss of Life or Death-Ebola Decides What is Safe.